Cable makes his debut in Uncanny Avengers #2. Art by Ryan Stegman. Deadpool 2 is looking to finally bring Cable from the pages of Marvel comics to the big screen. But there’s one daunting aspect of that—how do you explain a comic book history as complex and as absurd as Cable has? For now, it sounds like the answer is to avoid as much of it as possible. Allow us to explain why that’s an extremely good idea. The Cable that fans know and love today was created by Rob Liefeld and New Mutants editor Louise Simonson, and first appeared under the creative team of Liefeld and Todd McFarlane in 1990's The New Mutants #87. When he was first introduced, Cable was a rogue element who helped the New Mutants fight against the Mutant Liberation Front, a group of Mutant terrorists who fought for their rights by any means necessary. Eventually, Cable was accepted into the New Mutants as their leader, and reforged the group into the X-Force, a more militant branch of the X-Men. Eventually it was revealed that he was a time traveler from the distant future, on a mission to prevent Apocalypse from taking over the world. But technically Cable’s actual origin began four years before he made his New Mutants debut, in Uncanny X-Men #201 by Chris Claremont and Rick Leonardi... when Scott Summers and Madelyne Pryor had a child they named Nathan. And Cable, as his first self-titled solo series in 1993 revealed, is the adult Nathan from the future. Buckle in, because this is where stuff gets really confusing. The sixth issue of Cable opened the can of worms that was the very long, confusing timeline that is the history of Nathan Summers. First off, let’s start off with his parents. Scott Summers you might know easily enough, as he’s the famous X-Man Cyclops. Madelyne Pryor, however, is much weirder. She’s actually a clone of Jean Grey, who, at the time, had recently perished during the iconic Dark Phoenix Saga. Long-time X-Men villain Mr. Sinister had been working on making a clone of Jean, given life by a fragment of the Phoenix Force expelled during Jean’s death. This clone, physically identical to Jean and with all her psychic powers, was given new memories and a new name—Madelyne Pryor—and sent out into the world, where she met Scott, who was in mourning for his dead love. Scott, seeing a woman who looked exactly like Jean but was ostensibly a completely different person, got over the original Jean real quick. He and Madelyne fell in love, got married, and Madelyne gave birth to Nathan. Eventually—after Madelyne and Scott drift apart, she learns she’s a clone, and makes an evil pact with two demons that nearly ends up with her attempting to sacrifice Nathan and several other babies to open portals on Earth to the demonic plane of Limbo, like you do—the young baby is placed under the protection of Scott and the resurrected Jean Grey (let’s skip that part, or we’ll be here to the end of time of itself). But that’s not happily ever after for Nathan, as he swiftly gets captured by the followers of Apocalypse, the X-Men’s most powerful foe, who infects the child with a deadly disease called the techno-organic virus before he can be rescued by the X-Men. The virus, which corrupts organic tissue and turns it into metal, slowly begins to kill Nathan, and with no cure to be found, Scott and Jean are distraught... until a visitor from the far-future who says Nathan is a prophesied savior of Mutant-kind appears to Scott, offering to take the infected Nathan to the future to be cured. Scott and Jean accept, and Nathan is flung into the 39th century, where he comes under the protection of a character called Mother Askani. If that wasn’t confusing enough, Askani is actually Nathan’s half-sister Rachel Summers from a different timeline—the one from Days of Future Past, actually—who also lives in the 29th century after her own time travel shenanigans brought her there. So they’re both now living in a grim, far-off future where Apocalypse rules the world, but Askani/Rachel believes that Nathan is the only hope to stop him. Askani naturally brings Scott and Jean’s mental essence into the future, putting them in cloned bodies of their 39th-century descendants, to raise Nathan to be the future destroyer of Apocalypse, detailed in the events of the 1994 miniseries The Adventures of Cyclops and Phoenix. With their help, Cable eventually defeats Apocalypse, and his reign of terror in the future at an end. Although Scott and Jean’s consciousnesses went back to their original times when Apocalypse was defeated, Nathan lived on in the future, working to rebuild the world Apocalypse had subjugated. After years of battling to fight for the future, Nathan, now calling himself “Cable,” eventually finds himself sent back to the 20th century on the hunt for his other long-time foe Stryfe, setting up his eventual first encounter with the New Mutants all the way back when he first appeared in 1990. Phew. Back to where we started! Before you pick up the pieces of your shattered, mindblown head just yet, we have to talk about Stryfe—because, unbeknownst to Cable, Stryfe is actually a clone of Nathan, made by Askani in case Nathan succumbed to the techno-organic virus when he first came to the far future. This clone was captured by Apocalypse and raised as his evil, faithful servant. As you can probably gather by, well, everything you’ve just read, Cable understandably has a lot of beef with En Sabah Nur. Apocalypse has dogged Nathan throughout his life and various eras. Presumably, it’s because all of the above is a complete and total nightmare to try and even begin to bring into an Apocalypse/X-Men story in the movie universe. 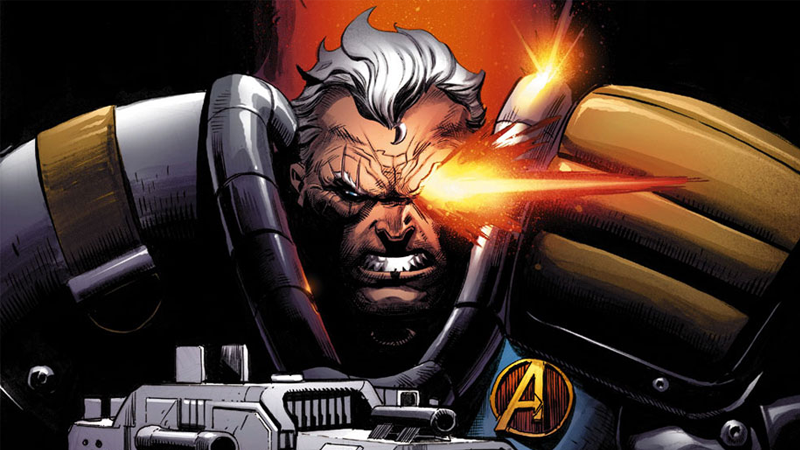 Cable as he appeared in Marvel Now’s Cable and The X-Force. So now that we’ve broken our minds witnessing the time-bending history of how Cable came to be, here’s why he’s still a badass. Aside from his very own time-traveling ship, future tech, and a lifetime being trained to use advanced weaponry, as the kinda-sorta-technically son of Jean Grey, one of the most powerful psychics in the Marvel universe, Cable has also has his own fair share of telepathic and telekinetic powers. These powers have waxed and waned over the years, though, thanks to the affliction of the techno-organic virus (and the needs of the comics’ various plots). Cable actually uses his powers almost constantly just in order to keep the virus at bay and from turning more of his body into metal, so he can only use them in a limited capacity in general without bringing harm to himself. Cable has also been cured and re-inflicted with the disease several times, and sometimes these psychic abilities have vanished entirely. As of today, in Cable’s appearances in both the ongoing Uncanny Avengers series and 2015’s Cable and Deadpool miniseries, his psychic powers are back, as are the cybernetic implants that eventually replaced his virus-ravaged arm and eye. So if Cable is so intrinsically tied to Apocalypse, why is he being introduced as part of a Deadpool sequel and not as part of the mainline X-Men films? It’s because Cable and Deadpool have a history together in the comics almost as long as Cable and Apocalypse do. Their relationship is pretty straightforward, although its origin is, of course, a nightmare. The two characters first met in Deadpool’s first-ever appearance in New Mutants #98, just little more than a year after Cable’s own introduction in the series. Deadpool has been hired to assassinate Cable by the evil Genesis, a.k.a. Tyler Dayspring, who is Cable’s future son from the 39th century while Cable was running around rebuilding earth after beating Apocalypse. (Stryfe, of course, was the one who turned his nephew evil, just to mess with his clone brother. We’re not even going to go into it.) Anyways, Deadpool eventually crosses path with Cable again when the New Mutants are reformed into the X-Force, although Deadpool would not officially join the team until 2010's Uncanny X-Force. While the two characters had a familiarity with each other because of their time in the X-Force comic, the idea of two as a duo wouldn’t actually come into play until the mid-2000s, when Deadpool’s co-creator Fabian Nicieza teamed up with Reilly Brown to write a Cable & Deadpool ongoing series. Cable’s gruff self-seriousness was the perfect foil to the goofy shenanigans of Deadpool, and the series was a massive success for Marvel, lasting for 50 issues until it came to a close in 2008. The duo were briefly reunited for a miniseries of the same name in 2015, too. Combining two such wildly different characters made for a lot of comedic potential that endeared readers to Cable and Deadpool alike. Even though a potential appearance in last year’s X-Men: Apocalypse might have made some sense, in terms of sheer fun—the primary currency in which this latest adaptation of Deadpool gleefully deals in—the thought of meeting Cable in Deadpool 2 is much more entertaining. Hopefully the movie will stick to its current plan to deftly avoid explaining just who the character really is for now, though.